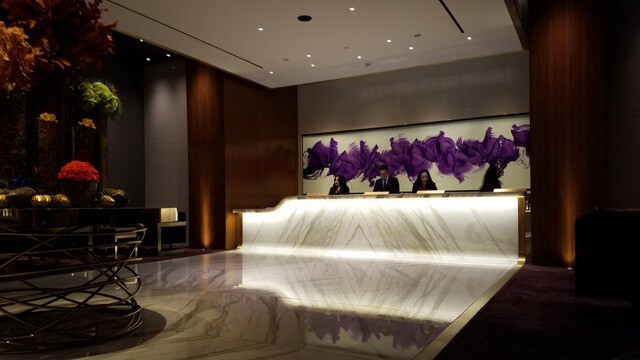 Aria rebranded their (non Sky) Suites in late 2015 as the Tower Suites. 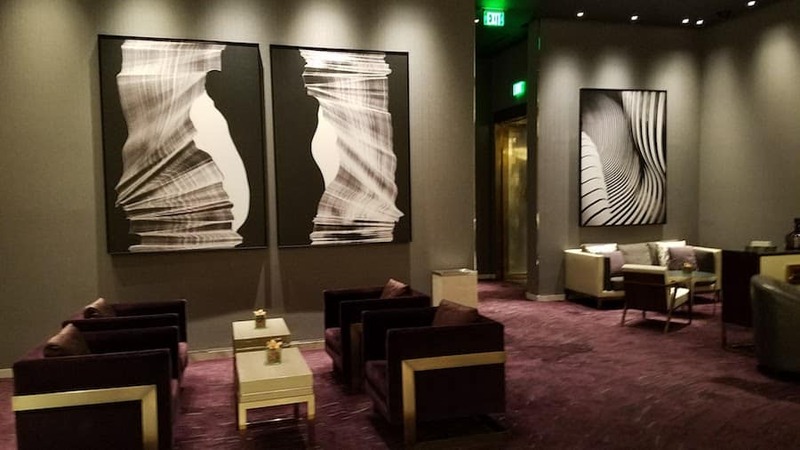 Besides the name change and a few amenities, the biggest change was the creation of the Aria Tower Suites Lounge off the lobby. 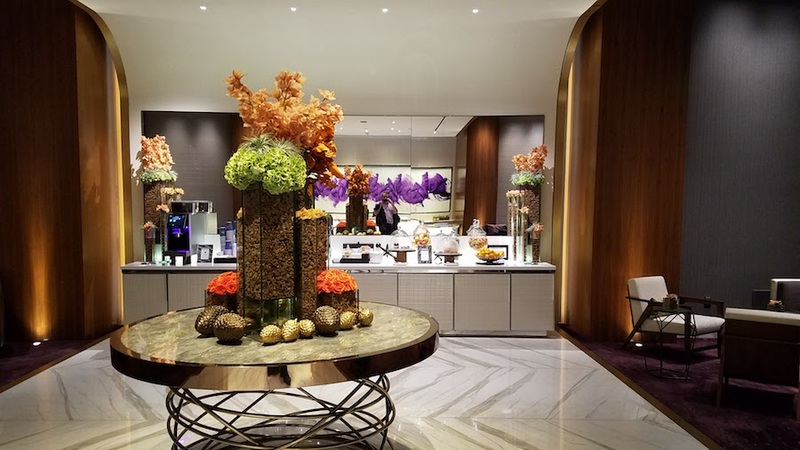 The Aria Tower Suites Lounge is available for Tower Suites guests to check in as well as stop in for refreshments throughout the day. 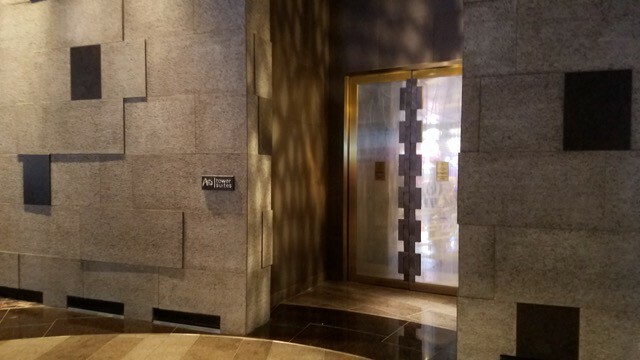 There are two entrances to the Aria Tower Suites Lounge. The first is beside the bell desk across from the concierge desk by the hotel lobby. It is a nondescript door. And the other entrance is off the floor of the casino. The lounge itself takes up some casino floor real estate in the northeast corner. Experience the ease of check-in from the Tower Suites Lounge. 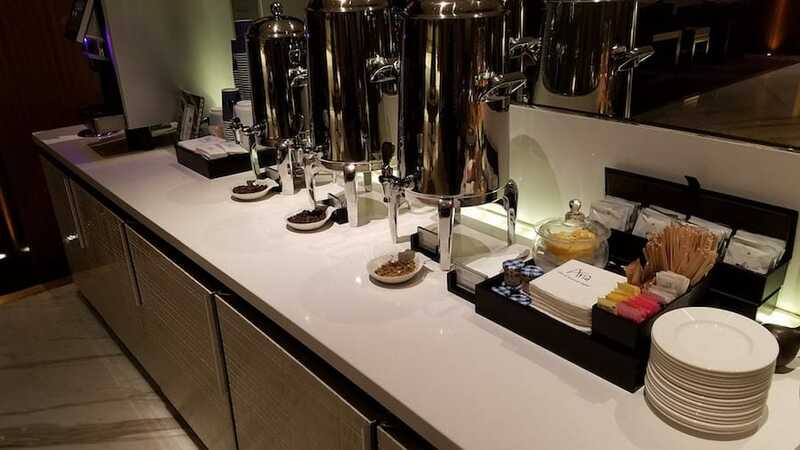 During your stay enjoy private access to the lounge where complimentary LAMILL Espresso, tea, juice and soft drinks along with light pastries and seasonal snacks are available. The lounge is open from 7:00 a.m. – midnight. Beverages and light snacks available from 7:00 a.m. – 10:00 p.m. 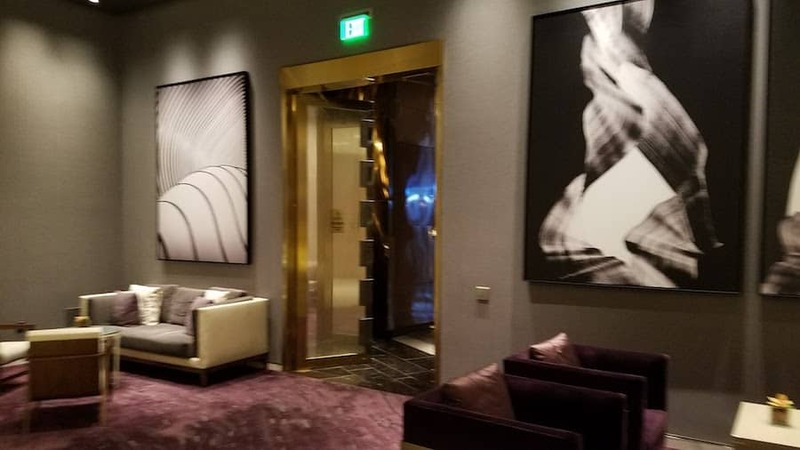 When I arrived around 8pm on a Friday evening to check in at the Aria Tower Suites Lounge there was one other guest checking in. There were two staff but one was in training so I had to wait a bit. It gave me a chance to get a water and snack. The space is quite modern with high ceilings (it used to be part of the casino). The staff was very professional. However I was not offered my “welcome amenity”. As a result, I called down to ask about it, and I was told it was a Rice Crispy treat. The snacks offered changed throughout the day. Mid-day they offered some desserts and pretzel rolls. 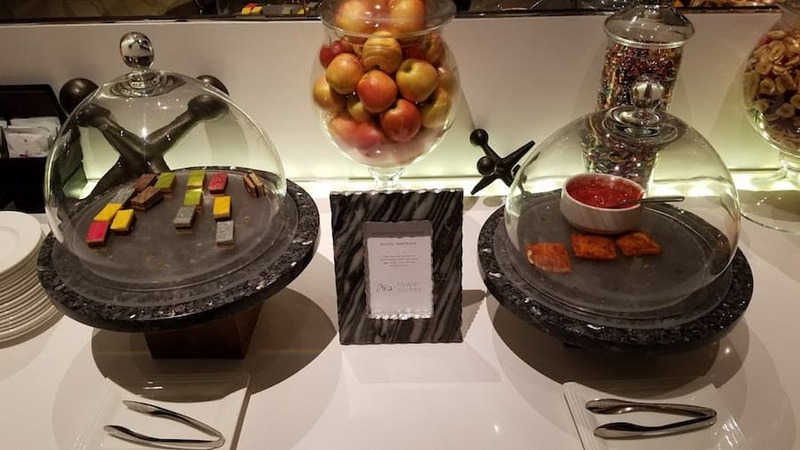 In the evening it was fried cheese ravioli and chocolate truffles from Jean Philippe. At all times there was coffee, tea, sodas, juice and water. When I stopped in mid-day the Aria Tower Suites Lounge was quite crowded with guests relaxing with snacks. While in the evening it was quite quiet. I had booked a standard Aria room but a few weeks before my stay was offered via email an upgrade to a suite for $75 a night. As I was on a comped room I decided to splurge for the upgrade. My original upgrade was for a Corner Suite (non strip view). Due to this being the lowest level of Tower Suites and does not entitle the guest to limo service from the airport. Also I wasn’t offered the Concierge Services, which was fine by me. I ended up being upgraded to an Executive Hospitality Suite. The Aria Tower Suites Lounge is a nice addition to the property. 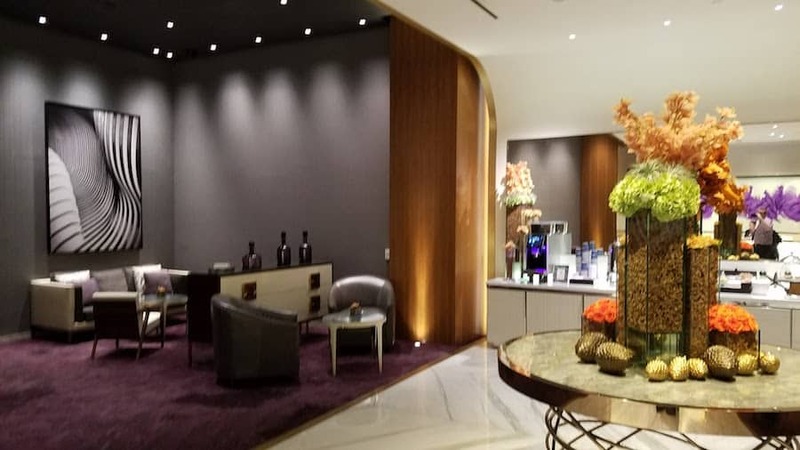 Most noteworthy, it is not the M life VIP Lounge that can be found at other hotels. As of now Aria does not offer lounge access to elite members. In conclusion, if you are a guest of one of the Tower Suites it is worth making a stop or two in the lounge.